In the above screenshot, you can see the mesh for the Istio Bookinfo demo. The reviews application consists of three versioned workloads, and two of the workloads talk to the ratings application. The edge between the productpage and reviews:v1 is highlighted (by clicking on it), which shows on the right side more detailed statistics about the request traffic and response time. In the screenshot below you can see that there is something bad going on in the mesh. Parts of the graph show red and in the right sidebar, you can see that around one-third of the requests end up in an error. When you look closer at ratings:v1 and the ratings triangle, you will see a y-shaped icon. This icon indicates that the ratings service has an Istio VirtualService applied. From reviews:v2, requests reach the ratings:v1 workload, but from reviews:v3, the requests are failing. 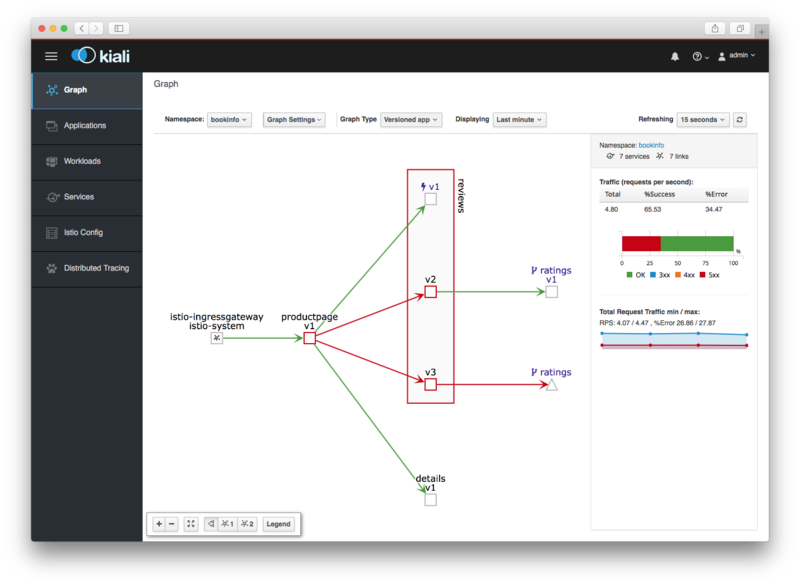 Kiali can also validate the Istio configuration. For example, Kiali shows a flag if the weight sum of the above HTTP routes does not add up to 100%. 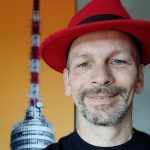 The Kiali documentation has a page on getting started in OpenShift or plain Kubernetes. 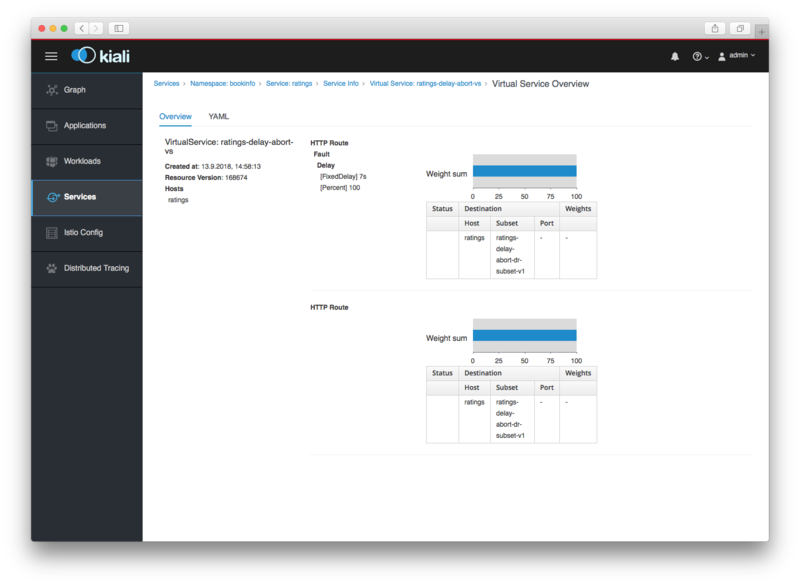 If you install upstream Istio, you can also choose to install Kiali with it. Have a look at the configuration options for Helm or customization with Ansible. Logging in to Kiali (for now) is done using admin/admin. Kiali is open source and released under the Apache V2.0 license. The source code lives on GitHub and any contributions are welcome. Please have a look at the contributing section of the README before you get started.